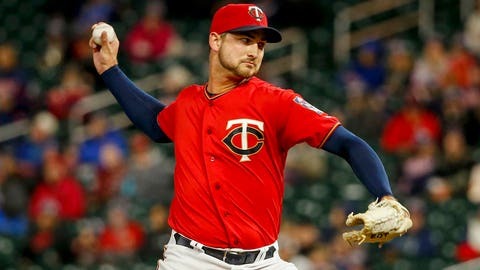 The Minnesota Twins bolstered their pitching staff Saturday, adding right-hander Chase De Jong to their 25-man roster. To make room for De Jong, first baseman Tyler Austin was designated for assignment. De Jong, obtained for Seattle last year for Zach Duke, made four starts for the Twins in 2018. He went 1-1 with a 3.57 ERA and 1.358 WHIP. He was taken off the 40-man roster in the offseason but invited to spring training. De Jong was slated to pitch for Triple-A Rochester but did not pitch in the April 4 opener. Austin was acquired last season from the New York Yankees in the Lance Lynn trade and played in 35 games for the Twins, batting .236/.294/.488 with nine home runs. However, with the addition of C.J. Cron in the offseason, Austin took to the bench and had appeared in just two games thus far in 2019, going 1 for 4 with a double, walk and three strikeouts. Minnesota plays the second game of a three-game series against Philadelphia on Saturday at 1 p.m. The game can be seen on FOX Sports North.